We are so excited for our first date night workshop tonight!! We will be making giant yard yahtzee sets complete with toss basket and score sheet clipboard! Can’t wait to see what all of custom sets our “students” create! Let’s Learn Paper Heart Origami! So it was finally time to take down Christmas decor in my house…I know, right!? And I had all of this cute Rifle Paper Co gift wrap from some DIY decor that pained me to throw away! Since some of it was just cute red/pink patterns, I decided I needed to find a way that I would be able to salvage it and perhaps reuse for a Valentine’s Day craft! 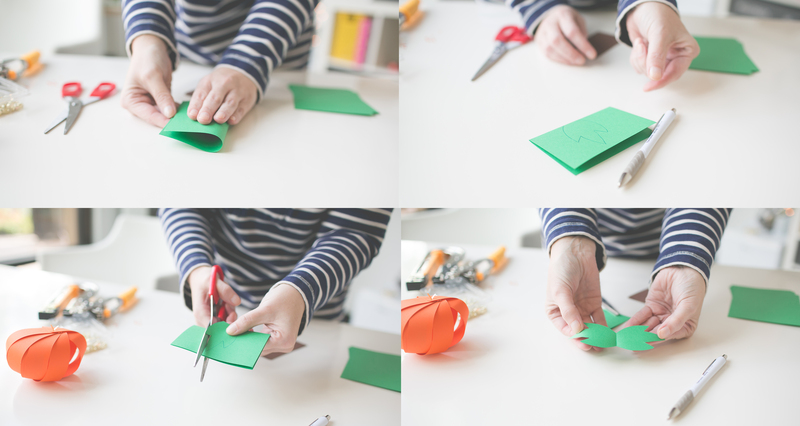 TIP: Try to use thin paper- if you are using a thicker paper (like our gift wrap sheets) it works better to go BIGGER. 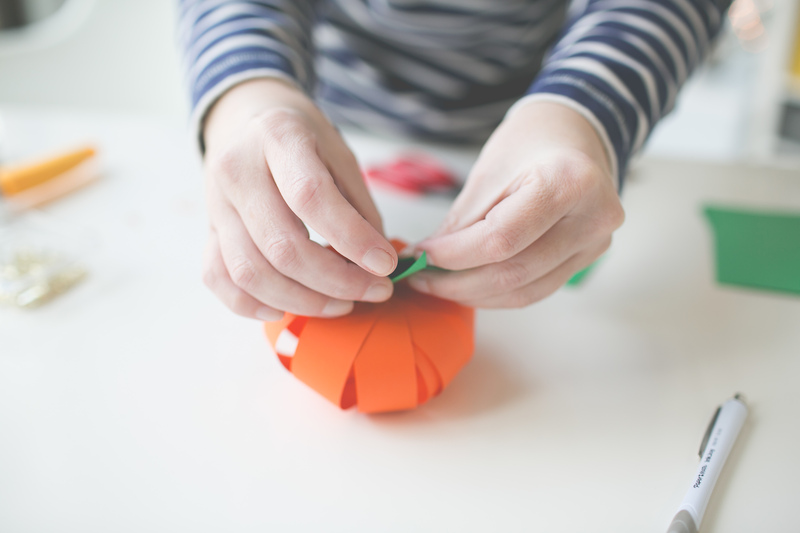 If you want to fold small, opt for origami or tissue paper. H A P P Y F O L D I N G ! Last Minute Christmas Decor using Leftover Gift Wrap! OMG. You are hosting Christmas dinner. You have the menu all planned out, the in-laws are flying in tomorrow and you barely finished up shopping for everyone! Whew- you’ve got this, but your abode is looking less-than festive. Girl (or dude…), we got your BACK! Here are some easy ways to spruce up your home with the gift wrap you ALREADY HAVE! Genius? We think so. Most of these ideas can be achieved in minutes and will have you looking like Martha Stewart in no time. 7 ideas- here we go! This is probably the quickest, easiest and most impactful. The great thing is that you are wrapping art that was already hanging on the wall, so you don’t have to create any new holes or move anything out of the way. We, of course, are OBSESSED with Rifle Paper Co. – so I had to hand select this paper in particular to go next to my sweet little felted Rudolph. Top it off with a BIG FAT BOW to make the best statement. We love The Pencil Factory Paper Ribbon, or you can cut a bow of your own out of a contrasting wrapping paper. Do you have any big cardboard boxes left over from purchased gifts? Cut em up and wrap em up! You can lean/tape them to the wall, or cut and adhere a triangle “kickstand” so they can stand on their own! These make the most adorable centerpiece or mantle decor. You can either wrap cardboard crafting cones for a sturdier option, or just twist and adhere your paper into a cone shape (as you would a cone party hat)- make sure you have an even bottom so they stand upright. 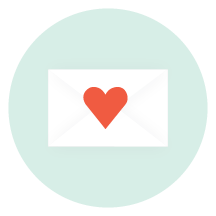 Take idea #1 or #2 and then wrap paper ribbon, string, or ribbon around the rectangle in a weave pattern to create little pockets for all those cute photo cards you collect in the mail. I found once I started getting a lot of cards on mine, it was helpful to have some washi tape or clothespins to help with arranging. Use strips of your favorite gift wrap (fold the edges under to give a clean edge) or paper ribbon to wrap around anything cylinder-shaped in your home. I used some logs I have, but you could also use planters, jars and vases. 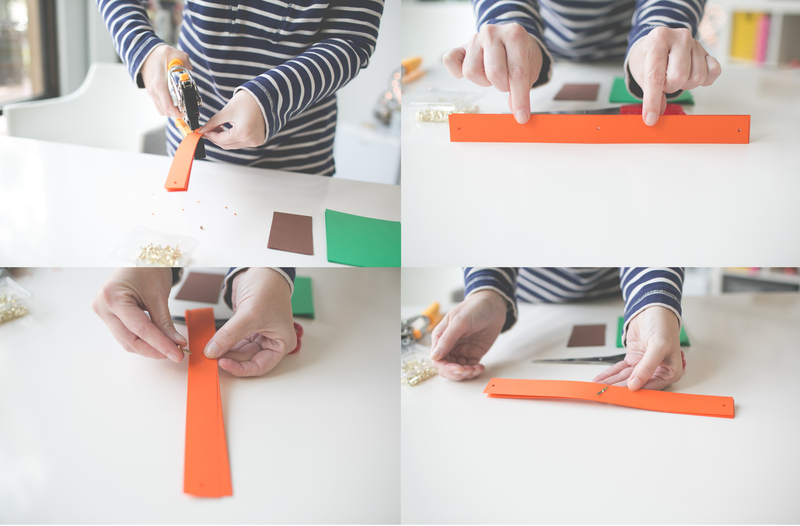 Wrap the strips of paper in a loop around the object and secure with tape in the back. If you are all caught-up on Christmas tasks and feeling ambitious, make a paper wreath! All you need is a circular and flat wreath form- this could be a plywood craft form or just a ring you cut out of cardboard, both work the same. Other than that- just paper and glue! Red wreath example– this is the more ambitious of the two designs. 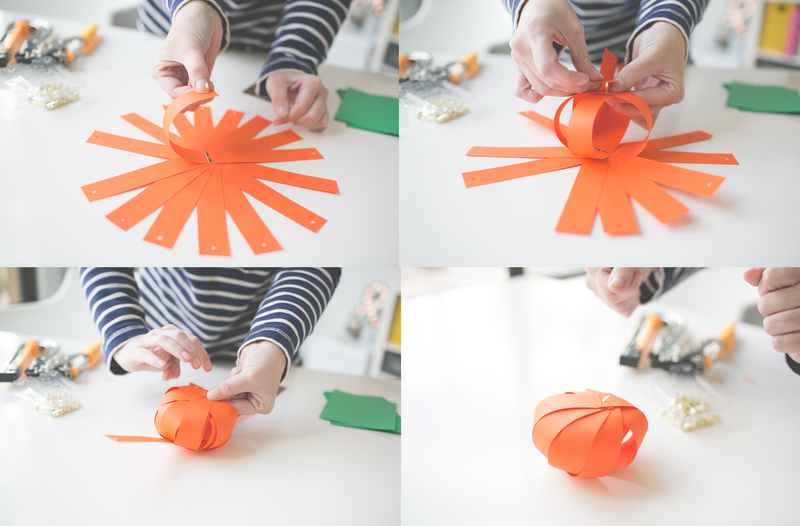 To get the “fluffy” effect, cut a million 3-4″ circles out of paper, fold in half without fully creasing it and then fold into a quarter. You will then have a point on one end and then a “fluff” on the open end. Then just arrange and secure the folded circles on the wreath form until you get the look you desire. Add a bow or embellishment of your choosing to finish it off! I used Elmer’s glue, but if I was going to do it again, I would used hot glue since it dries instantly and you can ensure that the pieces won’t un-stick as you are working. Plus, you don’t have time to wait for glue to dry…it’s time to start dinner. Blue wreath example- This “laurel” wreath design seriously took 20 minutes at most. Since it doesn’t have the “fluff” of the other one, it doesn’t take nearly as much time since you don’t need nearly as much paper to cover it. For the top, I just cut small circles out of patterned wrap and folded/creased them once in half and then covered the top of the wreath form with them. Then for the bottom, I used WHITE COPY PAPER seriously, the cheap stuff that was in the unused inkjet printer that takes up space in my home-office. I just folded the paper sheets in half and cut a half “leaf-like” shape over and over. Think of it like you are cutting Valentine hearts in grade school. I then glued down the bottom ends of each “leaf” starting at the top middle sections where I ended with the blue paper circles. Then just fan and arrange each side semi-evenly until you get to the bottom center. Voila! Simple. We hope that we could help you out with these last minute crafts to spruce up your Holiday home decor. They work year-round no matter what the occasion! Our gift wrap sheets are the perfect size for crafts like these and we have a crazy-good selection to choose from including: Rifle Paper Co., Wink Wink by Holley Maher, Smock, Kate Spade, Julia Green Illustration, Waste Not Paper by Paper Source, Sugar Paper, Melanie Folwell and even some of our own P+P designs! 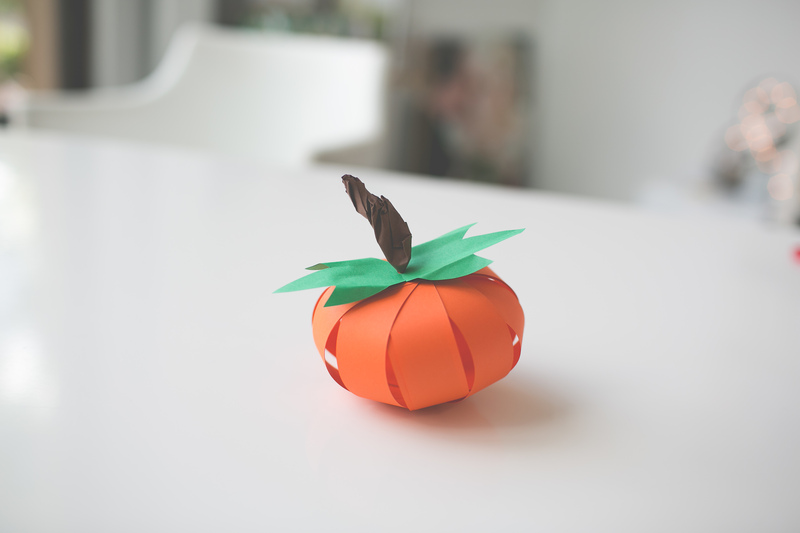 A few weeks ago we did these quick and easy, little, paper pumpkins as a free craft in our store. We got a great response, but I know that a lot of our Instagram followers wished they could have been there. I figured- why not do a little tutorial so you all can make them at home? I know, Halloween is this weekend- but this is such an awesome craft for any fall decor (would be so cute in a cluster for a Thanksgiving centerpiece!) Plus they only take a few minutes- so why not? 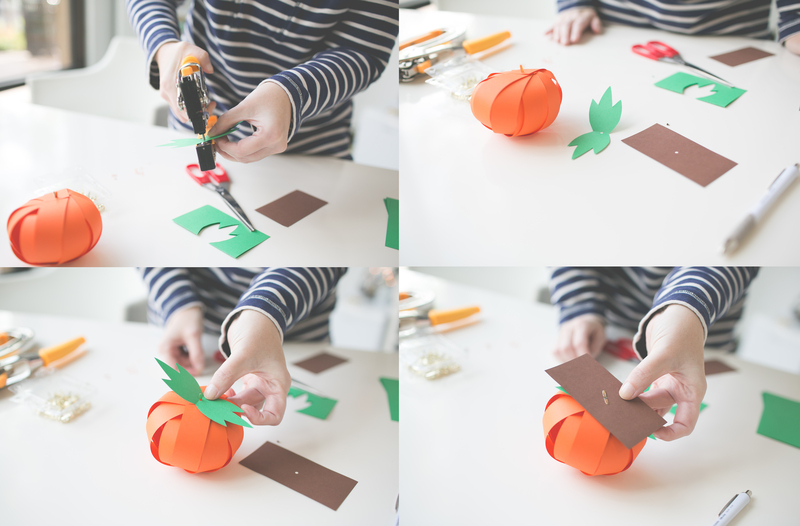 This is an easy craft for kids or adults! 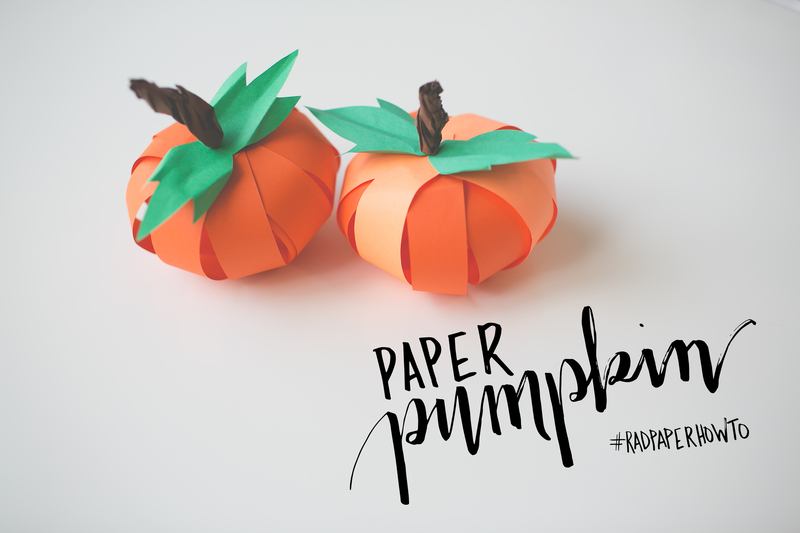 I would love to see it done with patterned paper or as a garland (WOULD BE SOOO CUTE) but whatever you do- tag us @paperieandpen #radpaperhowto so we can see! The supplies are pretty simple and straight forward. The best paper would be a text weight (thin) paper like from an office copy machine. 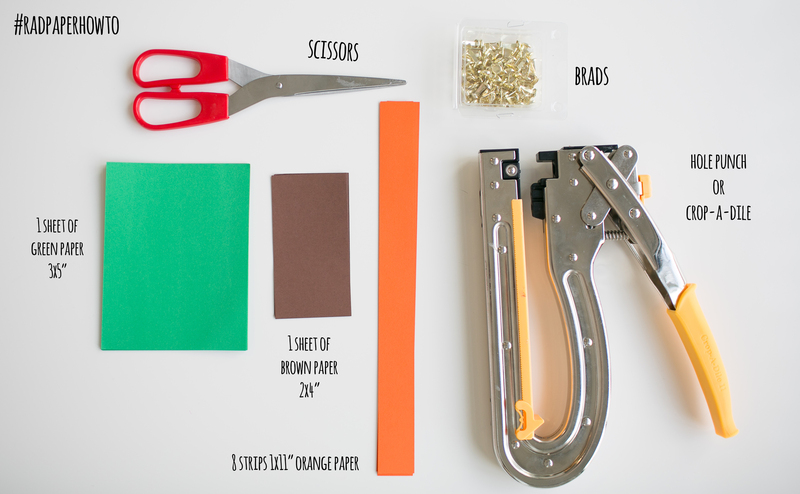 I think it would also work well to use wrapping paper or a non-cardstock scrapbook paper. 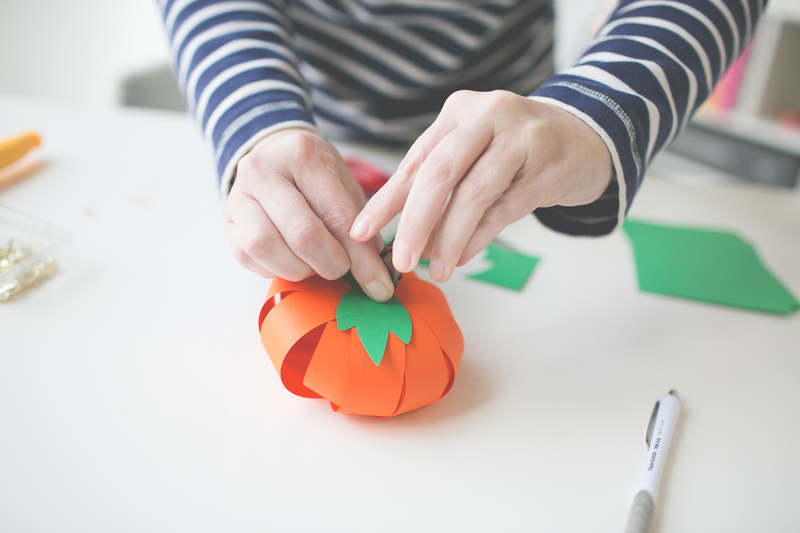 If you would like to make a larger pumpkin, you can make the strips longer and use more of them. A normal hold punch works fine, just make sure you are punching the holes in the same place. But if you do a lot of hole-punching, a Crop-a-dile will be the best thing that has ever happened to you…since you can punch through a whole stack at once! Punch 2 equal holes in your paper strips- one on each end, and one in the center. You will then assemble a brad in the center hole and fan out your strips into an equal circle. Take another brad (point side up) and start gathering the ends of the strips one by one until you for a nice spherical shape. It works best if you alternate strips that are across from each other. 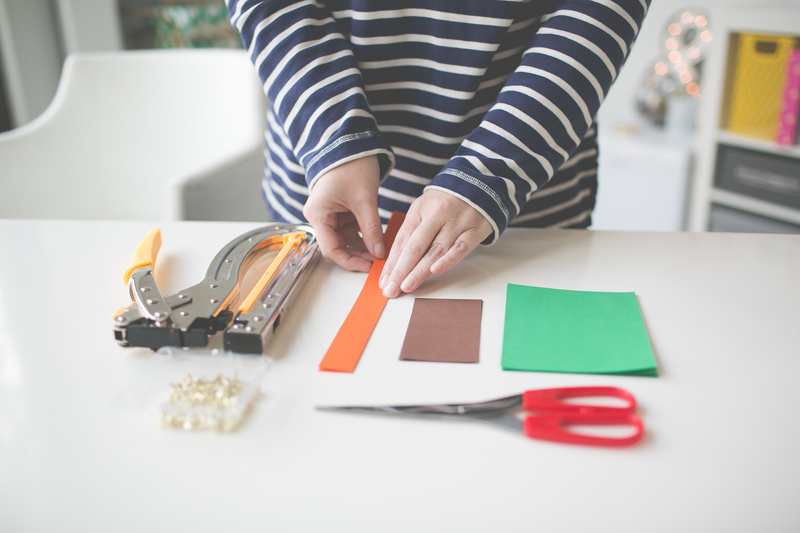 When you have collected all of the ends, loosely open the brad to keep it all together while you cut your leaves. Take your leaf paper and fold in half. Cut a leaf shape out of one side. If you would like to draw it first, you may- but you can just freehand with the scissors if you are daring. Open up your leaf shape and make sure you like the size with your pumpkin, feel free to trim down if you would like. Once you are ready, punch a hole in the center of the leaves and the center of your brown rectangle. Then you can open the brad at the top of your pumpkin and add the leaves and brown, then re-open the brad and tightly fasten. You can then start to scrunch and twist the brown paper into a stem. Be careful not to pull it off of the brad while you are doing this. But the more that you twist and manipulate the end upward- the more it looks like a stem.